Here’s a lovely addition to those hard to find interesting first chapter books. One of the unusual aspects of this particular first chapter book is that it focuses on the early grade student’s relationship to math. It’s easy to see in school how early the divide comes between those who love math and those who detest it. 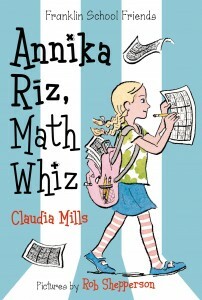 In this children’s book, we see the good-hearted attempts of one math lover to convince her friends of the glories of math. Interestingly, the conclusion at the end of the book is that everyone loves something different. For the reluctant math students, this first chapter book helps built some real-world incentive to learn about math. I think however, that the main focus of the book, consistent with the conclusion, is learning to accept oneself. The idea that best friends don’t have to be identical in their tastes is an important message. One disclaimer that keeps me from giving a totally glowing review is that this is not as simplified a children’s book as one might expect in a first chapter book. For a reasonably secure independent reader, this children’s book will work fine. A very new young reader may need a little support to stay with the book, as the chapters are a little longer than I would have put in a first chapter book. The vocabulary is also third grade level. However, there is lots of interesting parts to this book that will hold a reader’s attention. The main character is a girl (again!) and her bff’s, so it may leave some of the boys out in the cold, unfortunately. It’s not easy to get a first chapter book that hits everything – universal audience, interesting story, easy vocabulary- so I’m happy with any children’s book that comes reasonably close! This is part of a series of children’s books called Franklin School Friends, each one is also a first chapter book, and some have boys as the lead character. They would definitely be worth checking out.